I'm only 6 months into this big brand new world of blogging. What a wonderful trip it has been so far! Go Pet Friendly is hosting a Pet Blogger Challenge, and here it is! I hope you learn something fun about us and follow our adventures this upcoming 2015! I've been blogging since June of 2014 so only 6 months now! 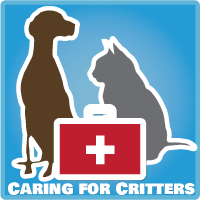 DZ Dog Adventures is about promoting healthy living with dogs - "An Exercised Dog is a Happy Dog", we support positive pet training techniques, healthy eating - including food and treats, and encourage others to continually be learning and improving their relationships with their pets. 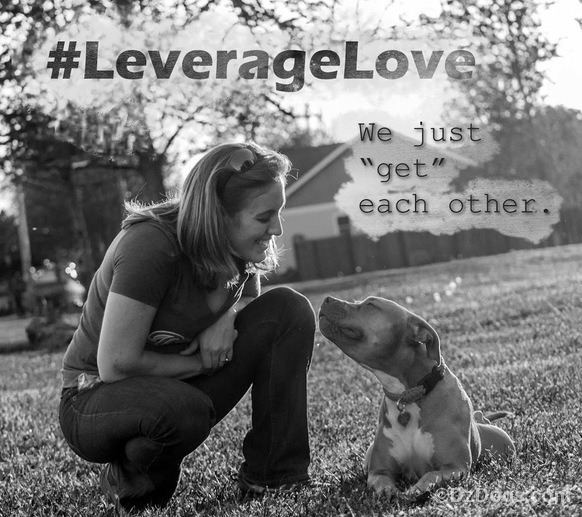 We're committed to being responsible dog owners and busting myths about bully breeds. 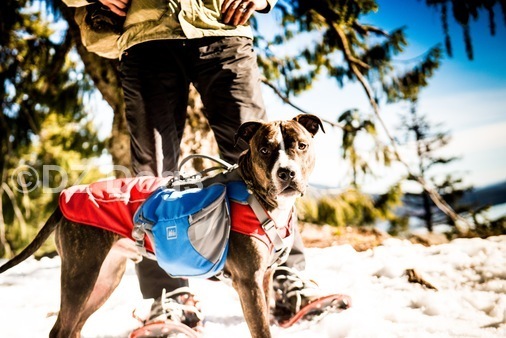 In our blog, we post training tips, techniques, homemade treat recipes, gear reviews because we love being outside and we catalog all of our fun adventures including: hiking, mushing, snow shoeing, trail running, camping, and soon to come agility with Ziva! Dante snowshoeing with us last season. One thing that is really important to us is proper gear. Having bully breeds, we have learned that their muscular bodies, deep chests, and short hair can make finding the right gear a challenge. 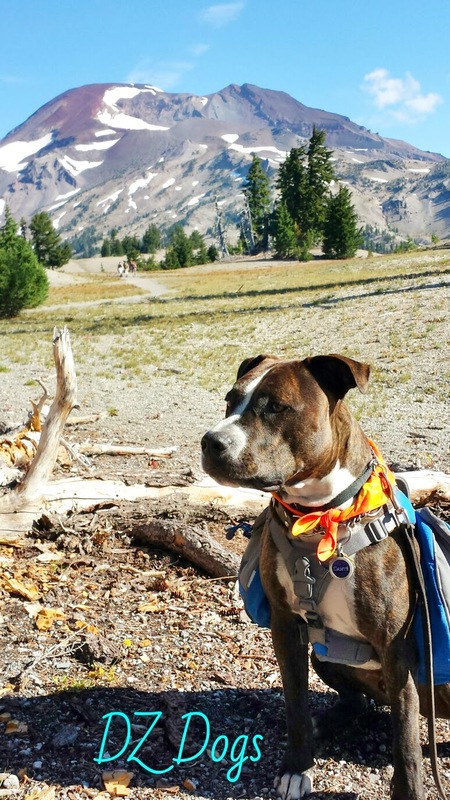 Our outdoor adventures led us to begin doing gear reviews to try and help other bully owners find good gear for their dogs that will hold up to the wear and tear of an adventure without harming the dogs. I'm very proud of the fact that our Reviews led us to be noticed by Ruffwear - we received a thank you gift from them for posting our Jacket and Shoe Reviews of their products. 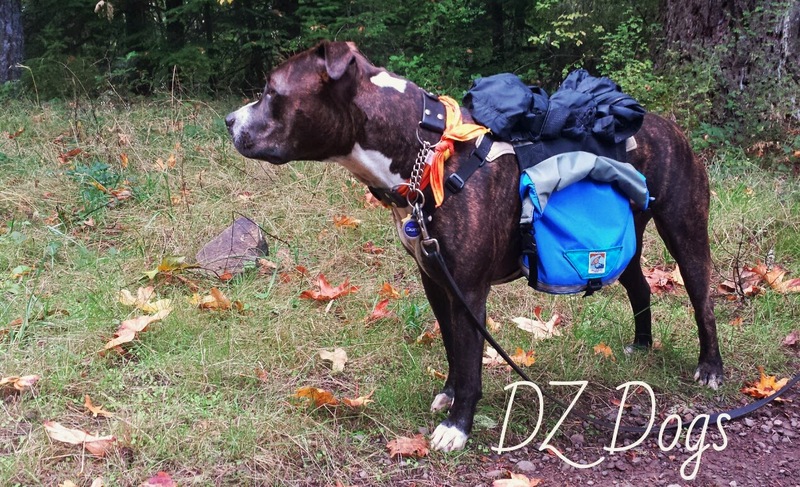 We also made a new friend in GroundBird Gear who gifted us an amazing custom fit doggy backpack after learning that Dante's REI pack cut his under his leg and across his chest, this review in fact is still my all-time most viewed post! What a great accomplishment! 3. What lessons have you learned this year - that could help us all with our own blogs? Just keep posting, people want to read not only about your dogs but about you! Be real with your readers regarding your struggles, and success in training and life. You never know when another person needs that encouragement - a lot of people struggle with the same things, or if another blogger maybe has an ingenious way of solving a problem that maybe you never thought of. But most of all, never give up on your dogs. Training involves your dedication and commitment, but together you and your pup can accomplish great things. My biggest complaint with dog owners are those who complain about a behavior and yet don't go out of their way to learn and correct said behavior. 4. What have you found to be the most successful way to bring traffic to your blog? I have learned that in order to gain fans and followers you need to be active! This means commenting on other blogs, responding to comments on your blog, participating in Google Plus Communities, Blog Hops, Facebook, and if you are really into it...Twitter and Instagram! My biggest traffic sources are Google Plus and Facebook. Hashtags - if you don't know how to use them then you better learn! And good descriptive titles help people find your articles. 5. What was your most popular blog post this year? Did it surprise you? I love that my Groundbird post and Bully History made top 2, my giardia post is a great informative article regarding what giardia is, how to contract it, and how to avoid it - this particular post has stayed strong up in my top 3 for many months. But most surprising was my Happy Thanksgiving post! It's just a sweet post regarding what I am thankful for, and some beautiful shots of the pups. This one is hard for me...we loved visiting Florida and meeting up with Walks With Rama. And doing the Groundbird Review previously mentioned. I think my favorite though would have to be my trip up the South Sister in Oregon with Dante. This post was soo big I had to do it in two parts! South Sister, Oregon part I - False Summit & South Sister, Oregon part II - True Summit. I love hiking but had never hiked anything of this magnitude, it was 12.1 miles round trip the terrain was grueling, and the elevation definitely made a difference. But we stuck it out and made it to the top! Dante was a champ of course, he met a lot of wonderful people along the way and made me a very proud mama when we encountered a few rather unfriendly dogs. At the end we were tired and beat up, but it was worth it! And next year we're planning on conquering the neighbor mountain, Broken Top and making it a family trip by bringing the hubby and Ziva along. South Sister from a distance. 7. Has your policy on product reviews and/or giveaways changed this year? If you do reviews, what do you find works best, and what doesn't work at all? 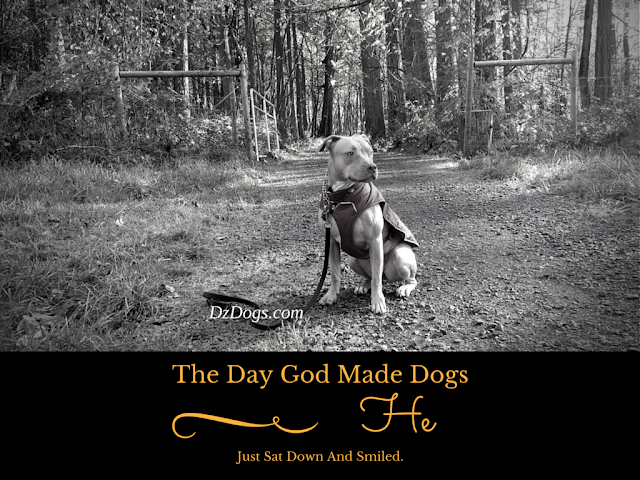 DZ Dog's will only do reviews for products that interest us and fit what our blog is about. I think the key to doing reviews is networking, this is still something new to us. But what has seemed to work is - we buy something we want to try, and then right up a honest review of that product. Our honest review includes what we liked, what worked, what didn't work, and what we would like to see done differently. And if ever asked to do a review, we always jump at the chance. I think one thing companies like to see is an active blog, that is well written and has interactive followers. Preferably this blog is easy to navigate, easy to find topics and search, and has a comfortable layout. If you have suggestions that'll help us do more reviews let me know! 8. What's your best piece of advice for other bloggers? Show your heart! And write because you love it. We tried the Google Ads for a while but I realized that it just cluttered up my blog and took away the real-ness. I don't want people to think this is done for profit - it isn't I also work, this blog is just my hobby. I want to be pretty open about how we are training our pups and the things we change as we learn through trial and error. We are much different pet parents now versus when we first adopted Dante. Sometimes you have to admit to a mistake in training, or let your followers know your struggles. For example: Ziva has had problems with fear re-activity regarding other dogs. It has improved! Hooray! But we have also in the past experienced difficulties, this has led us to try different things and now we're beginning agility in order to keep up all the forward progress we've made! But also - don't be embarrassed to ask for help or suggestions, chances are other people are either currently also struggling or have dealt with that issue and succeeded in the past! I want to just keep writing loyally! More specifically though I want to do a detailed catalog of Ziva's agility progress and training tips. I would also love to do more treat/gear reviews, and post more of my homemade dog treat recipes - something I've been putting off. For 2015 we also plan on hosting some giveaways and trying to build up a larger blog following. 10. If you could ask the pet blogging community for help with one challenge you're having with your blog, what would it be? How do you get more comments? If I had one comment per page view I would be doing great! I love getting feedback from followers. Your advice in #8 was great. I find that it helps everyone when we're honest about meeting challenges with our dogs. And we all have them at one time or another. It never helps anyone to pretend we're always perfect. You've only been at it 6 months. So the comments will pick up over time. Be patient. That said, I've found that asking a question at the bottom of my post for folks to answers makes a difference. And I'm really curious to know what people think so it's a win-win. But you're never going to get every visitor to comment. Some of your readers will be reading on there phones which I understand makes commenting a challenge. And sometime folks just don't have anything to say. I'd rather have a few thoughtful comments than dozens of "nice job" comments. Good luck in 2015. You've already made a great start. I just keep writing because it's so much fun, its great incentive though to keep writing when I know other people enjoy reading our stories. :-) Thanks for your encouragement! Great post!! I really like your blog! :) The post about the backpack was really helpful! I have a hard time fitting my dogs as well. I also really liked your Sisters hike post! Anyways, I do try to stop by as often as I can! I did this challenge last year, it was fun, but didn't really hit my market. I think my blog, well, it isn't like the others, its more information, on a very specialized sport. I will follow it again this year, cause there was some great reading on it! Comments are wonderful, and I am always happy to find well thought out comments. I did some of the giveaways, but my main audience will always be interested in what is being said, and the photos, whether or nor there are prizes to be had. Keep writing! I love your photos and reading your work! Comments are most important. I've found that leaving comments on other blogs that you enjoy works to some degree. I also will admit that if they never visit me and leave a comment I'll eventually move on. Thanks! We try to comment on others as much as possible too. Glad to have met you this year. As you know, I love adventures with pups. I liked your pictures of South Sister. My hubby and I did a hike near Broken Top with Chester and Gretel when we were in Bend a couple of years ago. It was not a grueling as your hike though. 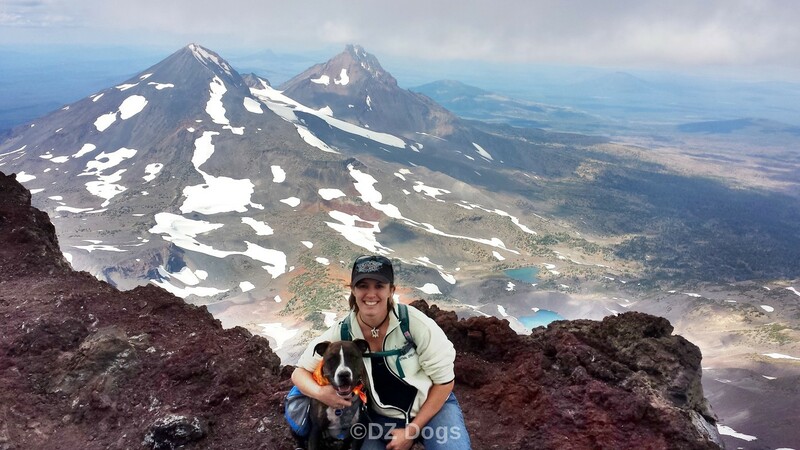 We're planning on doing Broken top this upcoming summer. :-) I'm looking forward to the fact that it isn't as hard. I love that you hike with your doxies by the way, that's awesome!! I love your advice on descriptive titles. In the early days I tried to be to cute with my titles and I think that stifled a lot of the SEO traffic I would have received in the early days plus it's very confusing to new readers. The best advice I can give for more comments is to be a more active commenter (meaningful comments) on other blogs, do giveaways and join blog hops. While I haven't been good about this over the past year or 2 in my own experience I have seen an increase in commenters when doing these three things. I've noticed good titles get me hits on google. :-) It's definitely a good way to drive traffic, even though I would love to have cuter titles sometimes. I loved all your answers!! 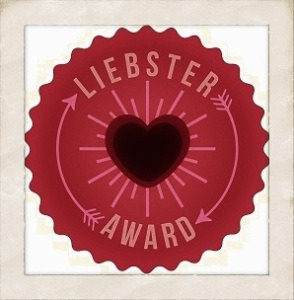 Thank you for joining the Challenge, and congratulations on launching your blog! I love that you're out with your pitties, changing the perception people have and showing other people that they can do it, too. Also, your photography is beautiful! I'm looking forward to following your adventures - and that first post on South Sister may come in handy this fall. We won't be going to the summit, but getting the boys out for the day would be great! Comments are something I struggle with, personally. I'm toying with the theory that there are two kinds of pet blogs: ones that are written to make friends, and ones that are written to provide information. My blog falls primarily into the latter category, though few blogs are 100% one or the other. (That being said, I have also made a lot of great friends along the way.) My point is that I see a lot of pet bloggers who get oodles of "stopping by to say hi" comments from their friends - which is great, if that's the goal of their blog. I don't get a lot of comments on most of my posts, because most people are stopping by to gather information, and probably don't have a burning desire to connect with me personally. Since my goal is to inform people (as is yours, I'm guessing), I think we may need to be content knowing that people are reading what we're writing and (hopefully) finding it helpful. We'll just have to make friends with each other! =) Good luck this year! I like you're point about the comments, I guess I just hadn't thought of that before but it makes sense! I'm kind of a weird cross between writing for informational purposes/sharing our adventures but i'm having fun and that's all that matters. Thanks for stopping by!! And Cheers! "To New Friends Like You!!"